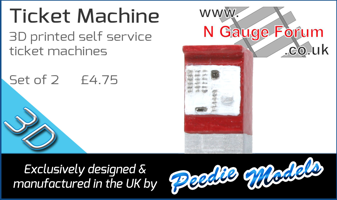 Why Did You Choose to Model N Gauge?. Re: Why Did You Choose to Model N Gauge?. Even a long run may not work out as well as one might expect. A friend of mine decided to build an end to end layout in his garden in OO, controlled from his shed at one end - total disaster, by time the train was halfway down the garden it was impossible to judge its position, so he had to employ a "runner" to tell him where it was, so he'd know when to stop it and make the reverse journey! Almost exactly my parcourse. Though space, in a 2 bedroomed appartment, was in my case a consideration. Since moving to a 4 bedroomed house 12 years ago I still haven't a home for the layout, as the cellar is now filled with spare parts & tools for maintaining a fleet of 5 classic Minis! I'm glad though that my stock boxes take up less than a quarter of the space a similar amount of OO stock would do! One day soon, when most of the Minis finally leave home, I'll be able to play trains once again. 'Til then I'm just "collecting". I had O gauge when very young and then OO as a young lad (didn't know better), but when I got back in to model railways (late 1970s) I chose N gauge because it looked and felt more sophisticated, acceptable, desirable and was relatively new and therefore something for the future. Oddly enough nothing to do with space, although that is an undoubted benefit. Unless you equip the trains with miniature CCTV cameras with the pics relayed back to the control station. But then you're getting close to simulators. Or, of course, build the trains big enough so you can get in and drive them. That'd save running around after them. I bought a tiny camera that ought to fit inside a suitable N-gauge NPCS vehicle, including a small battery, which relays black and white video signal directly to a TV tuner ... I haven't used it yet though! Anyone else had experience with this type of thing? I thought it might at least be fun to get an N-gauge driver's eye view of one's layout! Well I have always had an interest in small fine detiled models, so when it came to Model railways it was a natural progression. Plus N Gauge allows us what most of the other larger gauges don't, to be able to model and run more realistic scenes and trains. My decision to move from 4 mm to N gauge was based entirely on it offering me the opportunity to run realistic length trains through realistic scenic settings. It allows a more 'impressionist' approach to be taken rather than having to worry about the minute detail as you do in the larger scales. The sheer amount of kits available which at the time were not available in OO did it for me. Still a wider range in my chosen (Speedlink) period. Then add the improvements with accurate shaped 37's and 47's for starters and it was a no brainer for me. Still gradually flogging off the OO! I changed to N Gauge as a teenager in 1977 after visiting Pecorama and seeing a long layout built into a hallway. I had great plans to build a layout around my bedroom and into the loft space next to the room. The layout got as far as half way down one wall. I have one building left from this - a scratchbuilt model of my grandparents house. Purely for space. Didn't fancy a loft or garage based layout so needed to plump for a 4x2 max. Also had OO in the past so I suppose I also fancied a change. Primarily for space reasons. I modelled modern-image in 00 when I was growing up but my parents had a large loft on which I no longer have a claim. I always had a soft spot for the GWR so when Dapol released their autocoach and 1400 in N gauge, the rest was history. Well, that's just not good enough. Some fount of all knowledge you are! I bought 2 of the newer Hornby HSTs for a OO layout I was building but soon realised that they would look silly running as either 5 coach sets or entering the next corner after about one second of leaving the previous corner. To see my layout "Longcroft" which is currently under construction, you'll have to catch the fish below first by clicking on it! Dont know really, for my 7th birthday my dad said to me "Do you want small trains or big trains" ie N or 00 gauge. I changed to n gauge so I could run longish trains at slow speed inside the house. I have since built 3 small portable layouts, one of which goes with me in the motorhome on holiday! I suppose the vast increase in the visual standard has attracted me back to n gauge. I just wish the build quality of some of the products would match the appearance. Page created in 0.132 seconds with 47 queries.